2015 ATHENA Award recipient, Melissa Sanderson shares insight into leading across different cultures during December’s PWA. 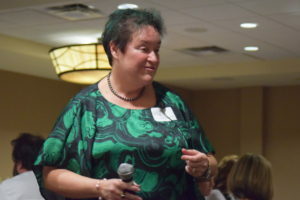 Melissa Sanderson walks around the room engaging the audience at December’s Professional Women’s Alliance Luncheon. Visiting 30 countries and living in 13 has taught Melissa Sanderson that languages, customs and scenery changes from place to place, but effective communication is a vital component of successful leadership across all cultures. Sanderson, a banker turned foreign affairs officer, encouraged attendees of December’s Professional Women’s Alliance luncheon to live fearlessly, seize opportunities and use effective communication in every leadership scenario. In our increasingly global society, it is important to understand what it takes to lead across different cultures. Many effective leaders make the mistake of leading in the same manner even when the culture in which they’re leading has changed. Sanderson describes culture as set of common beliefs and behaviors held and enforced by a set group of people. Language and history are the most integral pieces of culture that effective leaders should grasp. Understanding a country’s development leads to a better understanding of its people and customs. It also doesn’t hurt to speak the local language to minimize misunderstandings. Sanderson’s fearless leadership shines when she’s faced with difficult decisions. From surviving a firefight in the Democratic Republic of the Congo to changing careers multiple times, Sanderson is brave in facing the unknown and uncertain. Sanderson originally planned on attending the Thunderbird School of Global Management at Arizona State University after high school, but she decided to stay home and attended Ohio’s Xavier University after the passing of her father. It turned out to be a fortuitous decision, as she met the person who convinced her to take the Foreign Service Officer Test (FSOT). She passed. Fate continued to deliver Sanderson life-altering choices. Within one day, she received an employment offer from the State Department and an offer for a promotion and relocation from her then-employer, Saks Fifth Avenue. Sanderson was faced with the decision to either tackle something completely foreign or stay with the company doing what she already knew. Although she knew nothing about diplomacy, the encouragement of a good friend and a promise of training helped Sanderson take the leap into the unknown and join the State Department. That first successful leap helped Sanderson take her next jump into the wilderness, with her next position at mining giant Freeport-McMoRan, Inc. Also, she had no previous mining industry experience, but was an eager, fearless student. Her willingness to learn paired with her bravery in the face of the unknown has crafted Sanderson into an exemplary leader in Arizona and across the world. The next Professional Women’s Alliance luncheon will be on Tuesday, Jan. 10 featuring May Busch, international leadership consultant, former COO of Morgan Stanley Europe, and author. Learn how to leap forward in your career by learning the dozens of hidden rules to follow and skills to master in order to succeed and thrive. Register today!